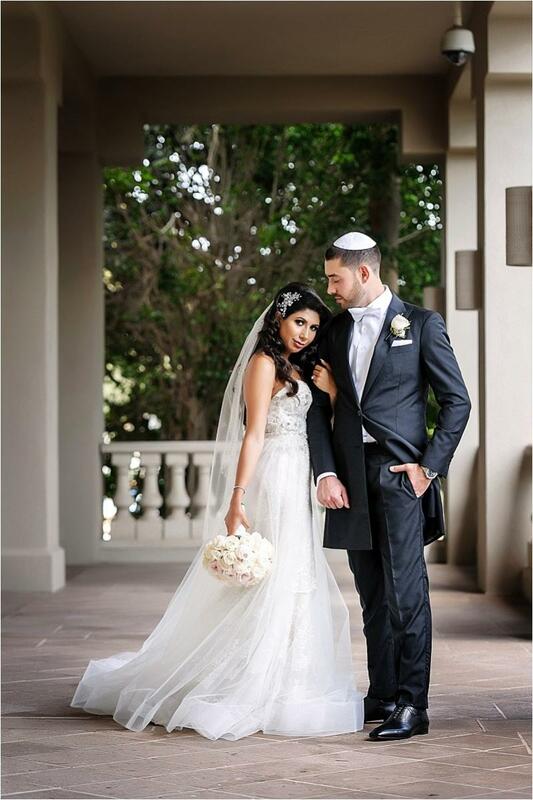 Mona and Yitzy’s relationship began very organically at a synagogue in Los Angeles during a Jewish holiday. 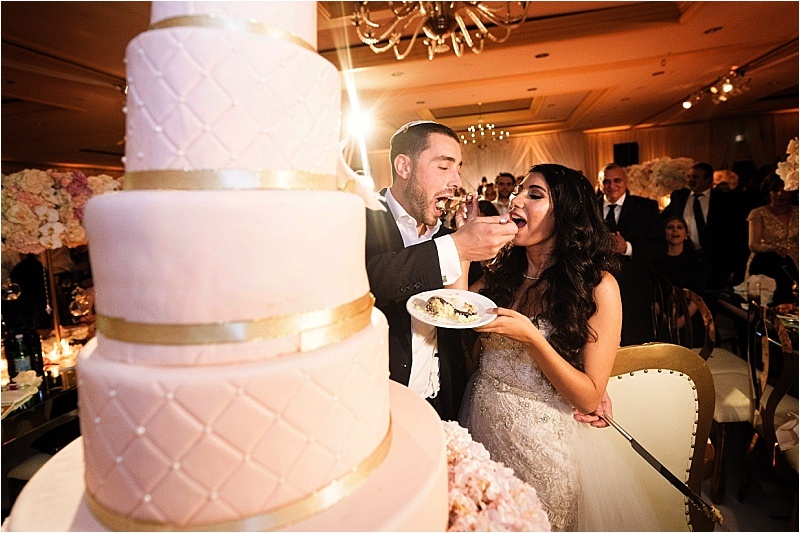 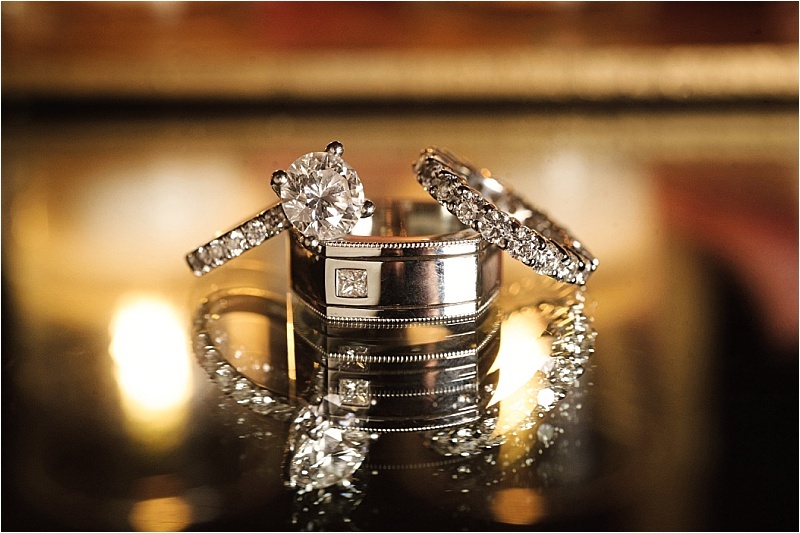 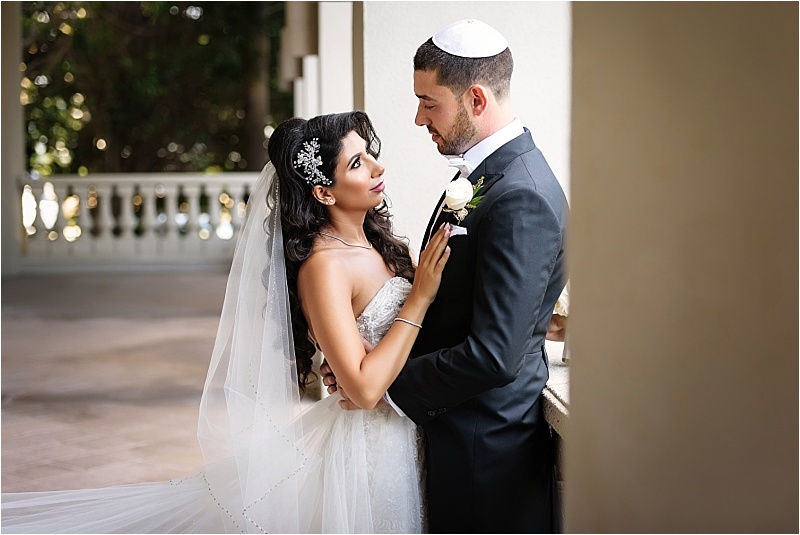 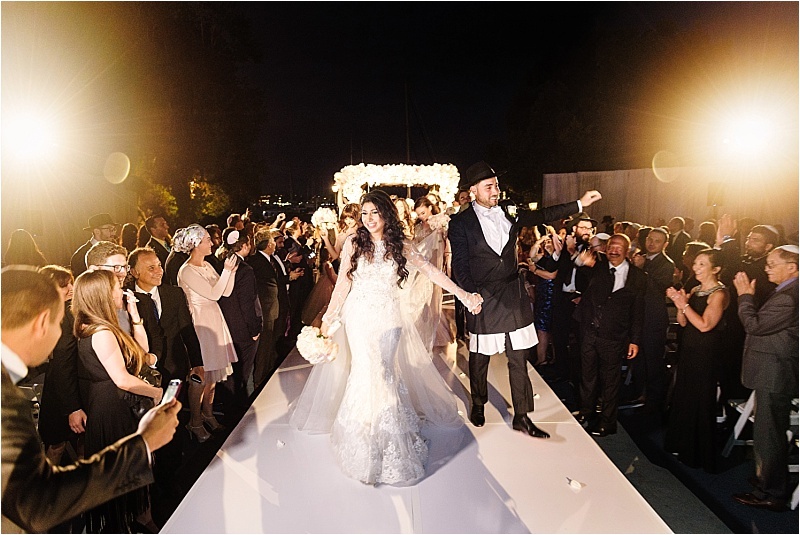 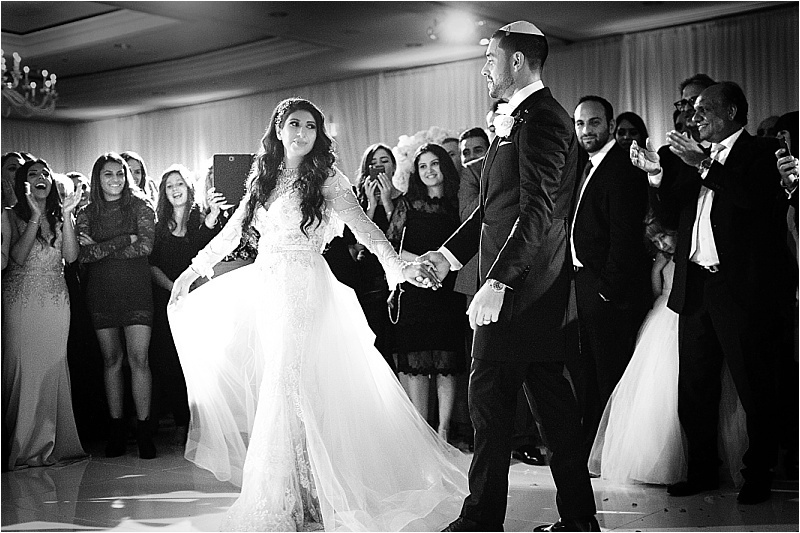 Yitzy’s family was visiting from Montreal and, when Mona was jokingly introduced as Yitzy’s “future wife,” they believed him and immediately offered their blessing for marriage. 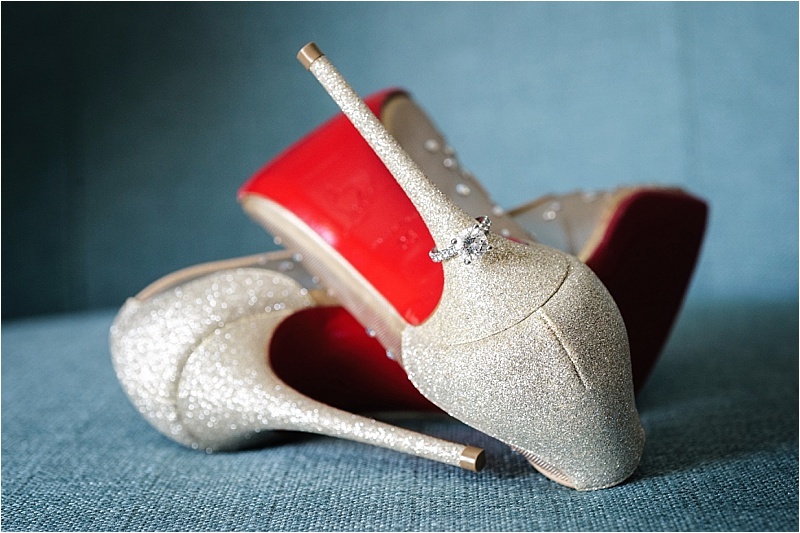 And with that, their fairy tale romance began. 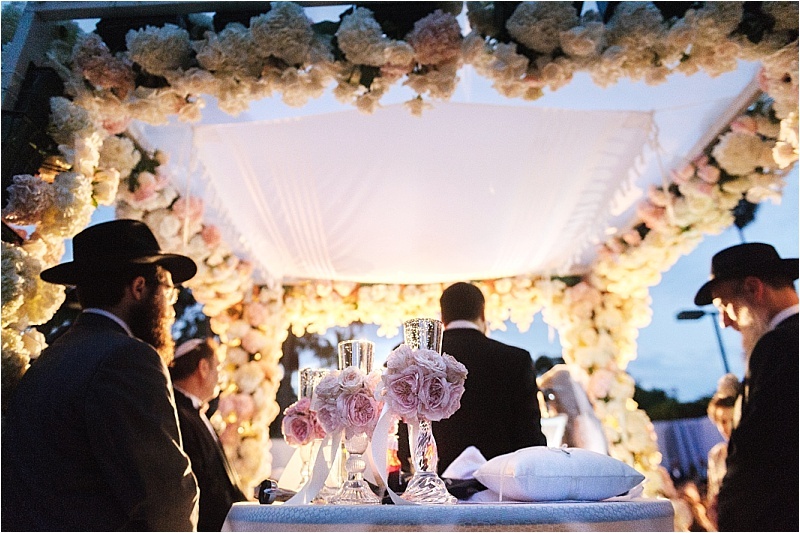 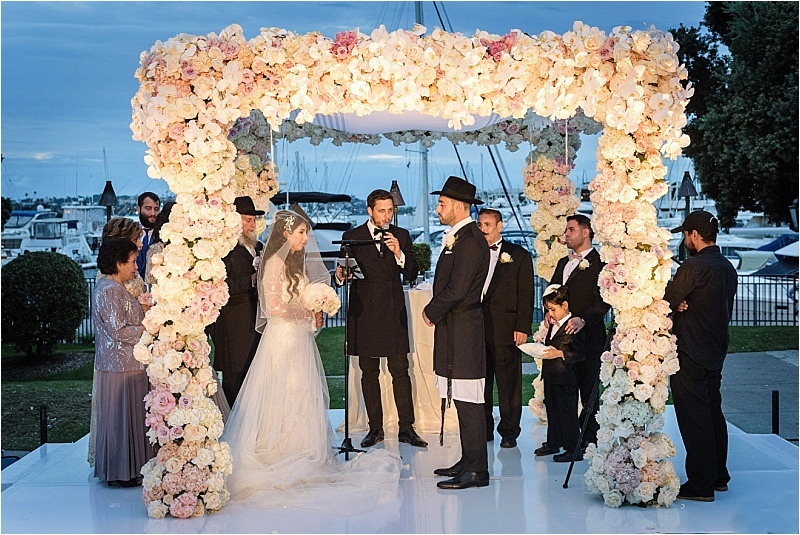 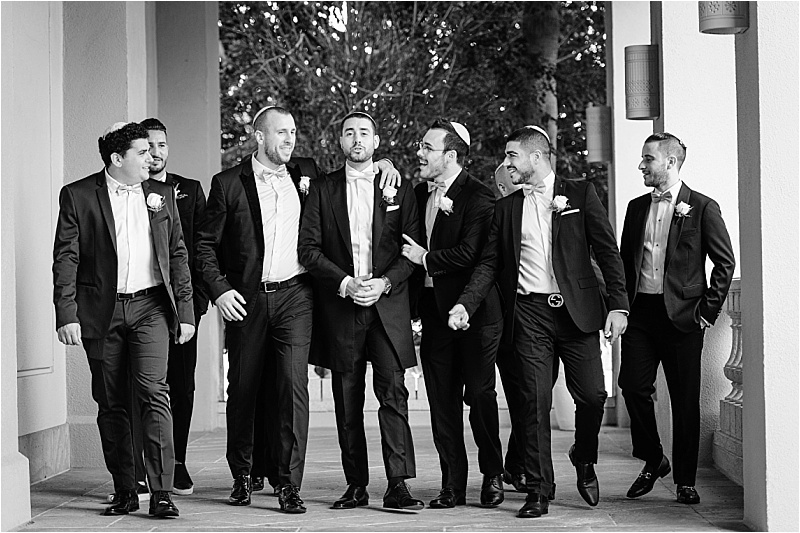 The couple wanted the wedding to be a traditional Jewish ceremony, so they had a room for the men to pray after signing the ketubah and before the bedeken ceremony, in which the groom unveiled the bride. 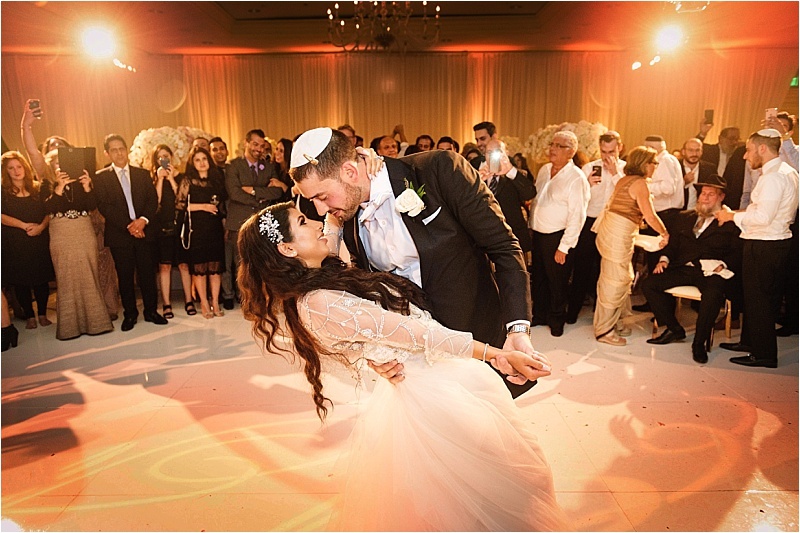 The couple then exchanged vows under a traditional chuppah (with a modern blush touch), and Yitzy finished by breaking glass. 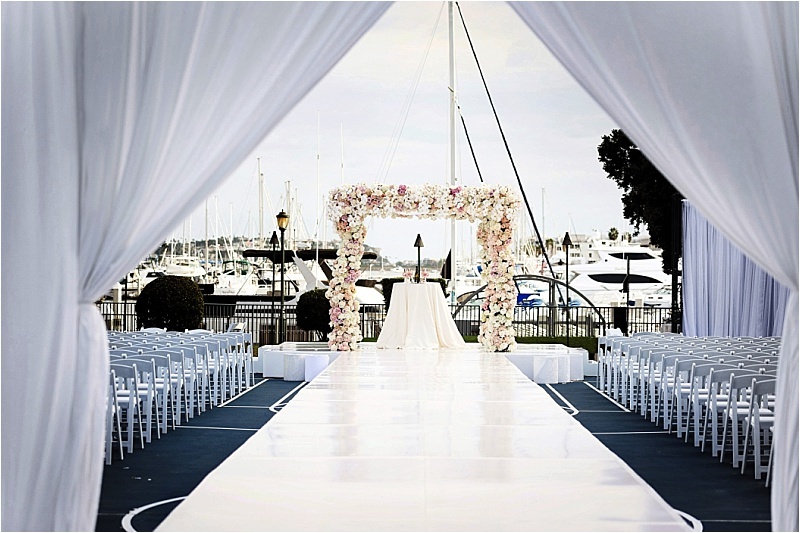 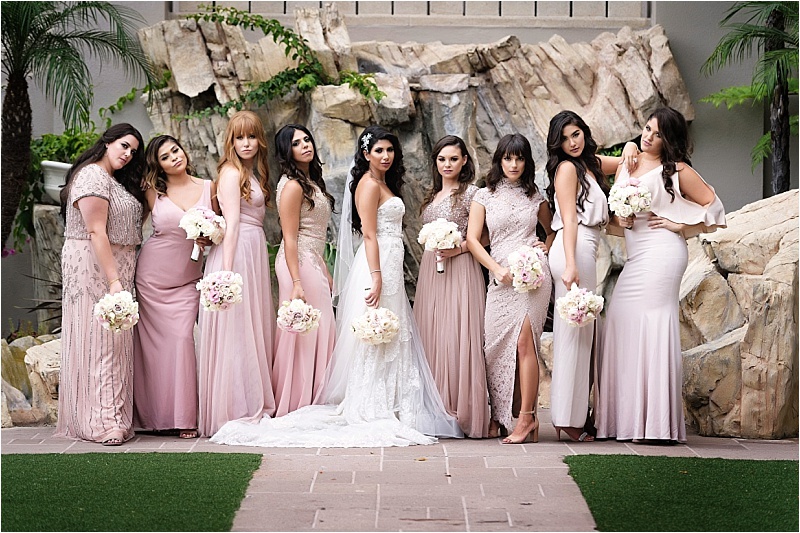 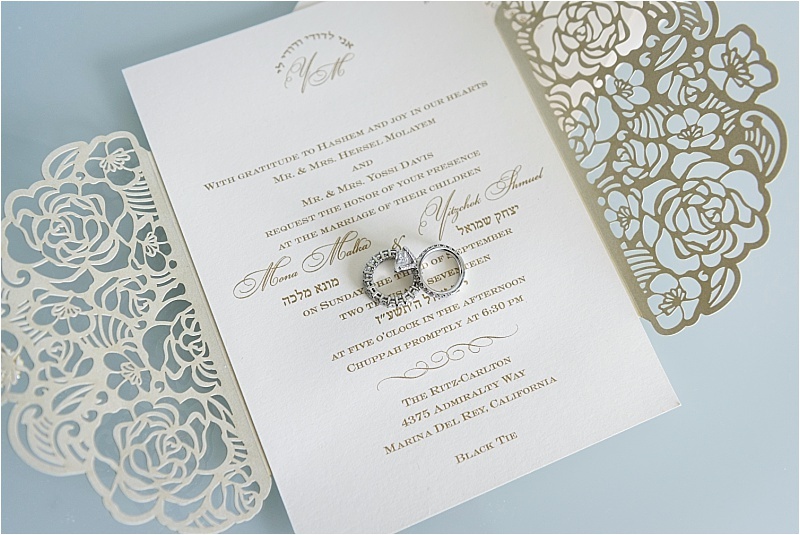 As a digital marketing professor at a well-known fashion school in Los Angeles, Mona was very instrumental in the wedding design details. 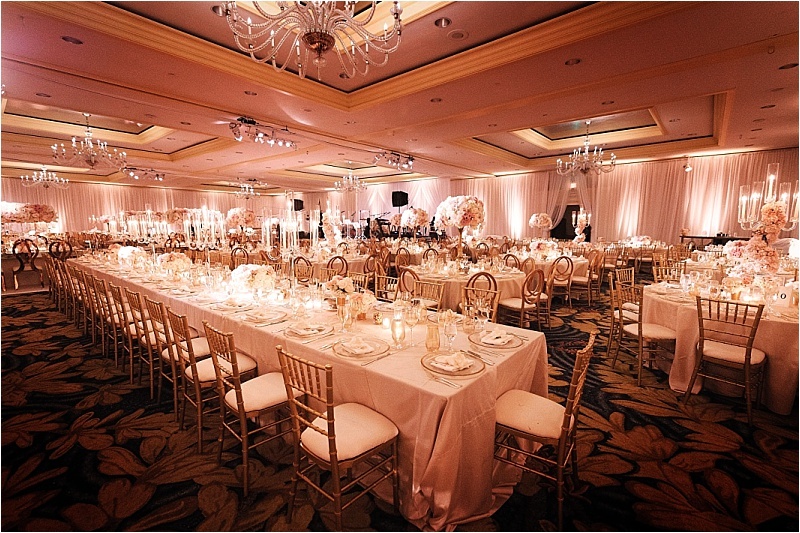 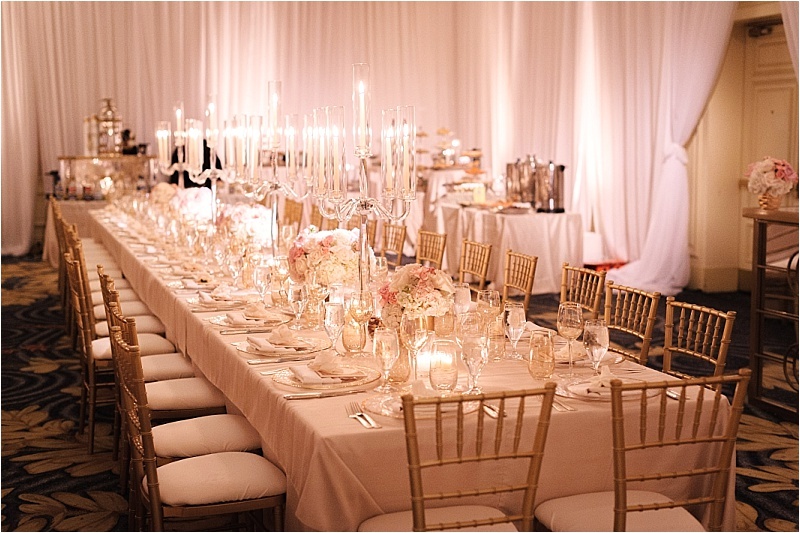 The reception was wall-to-wall elegance, with flowing curtains, soft blush table linens and candle-lined tables that made the whole room glow. 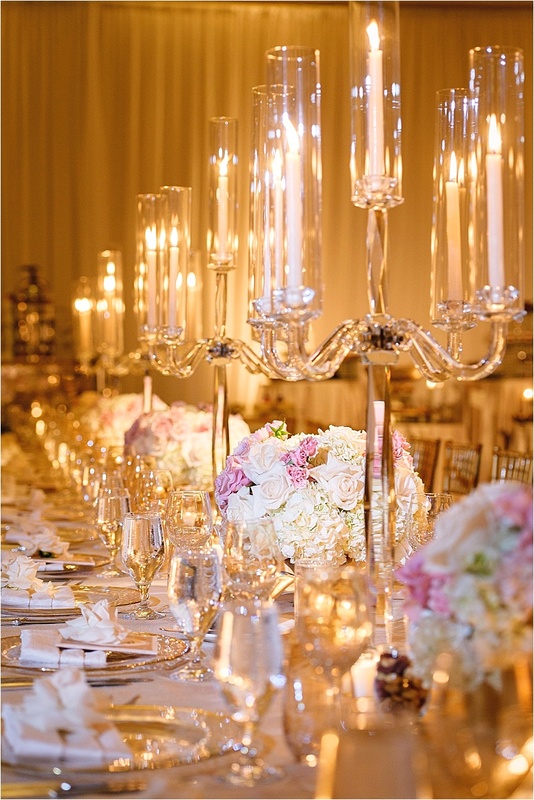 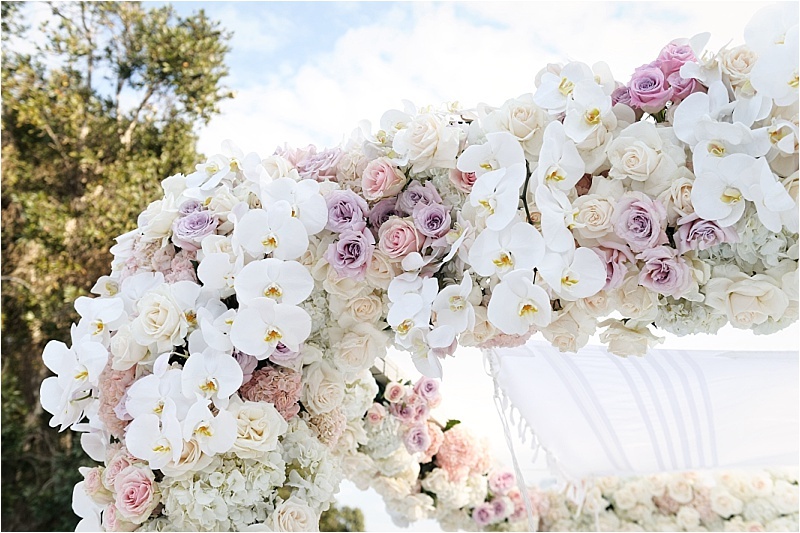 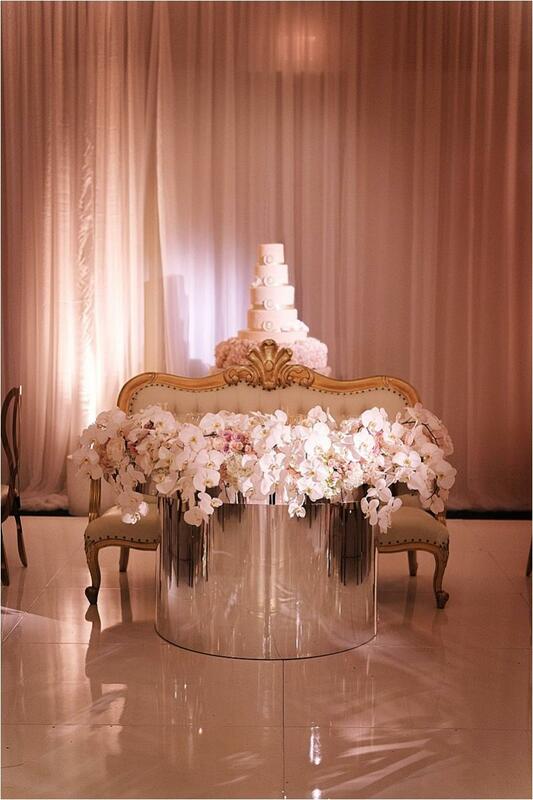 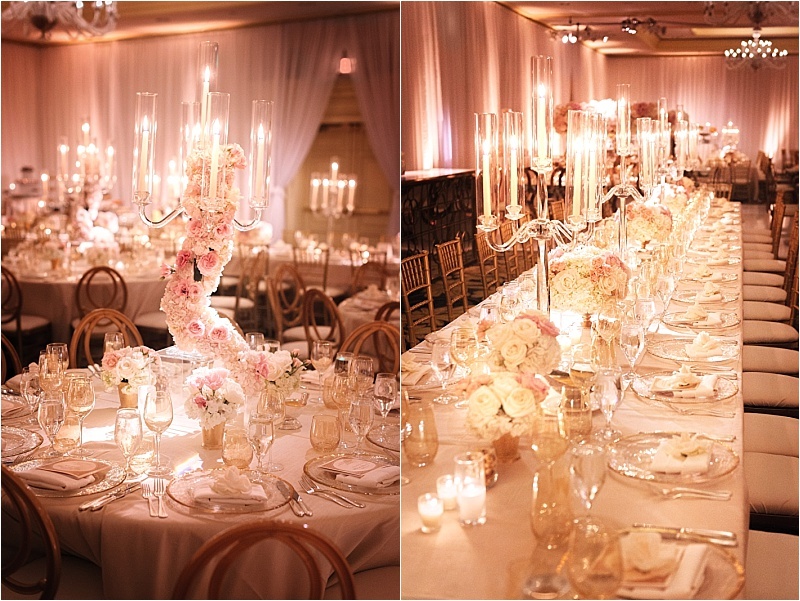 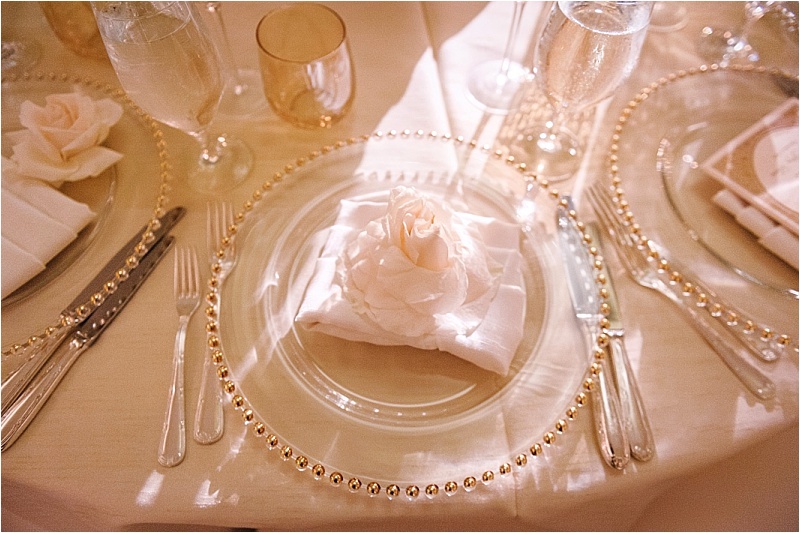 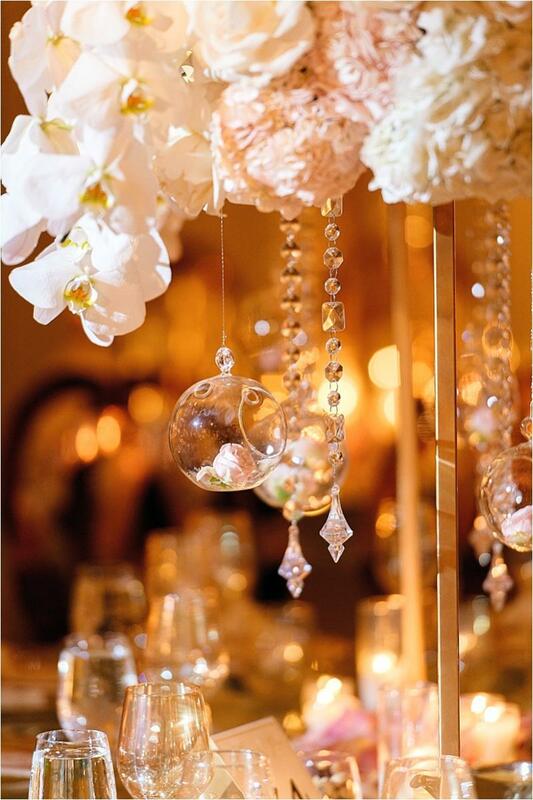 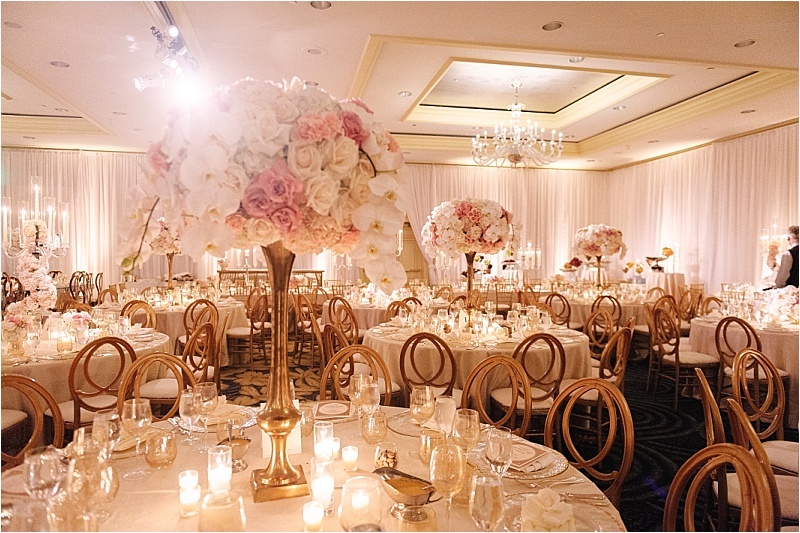 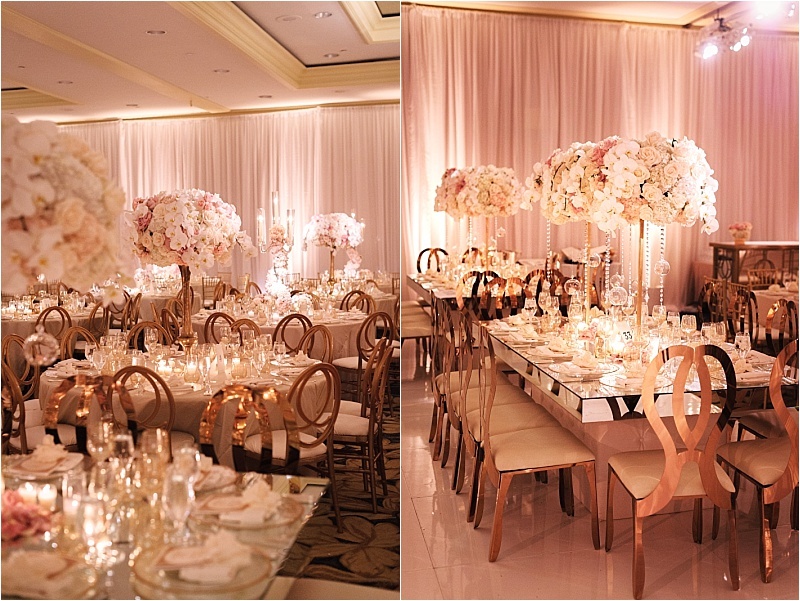 Each table was adorned with multiple centerpieces of various heights that were brimming with lush white roses and blush pink orchids and peonies. 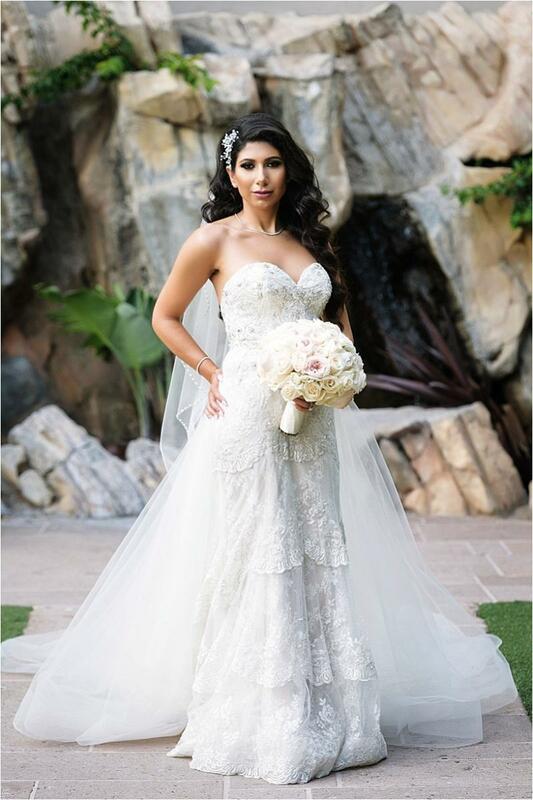 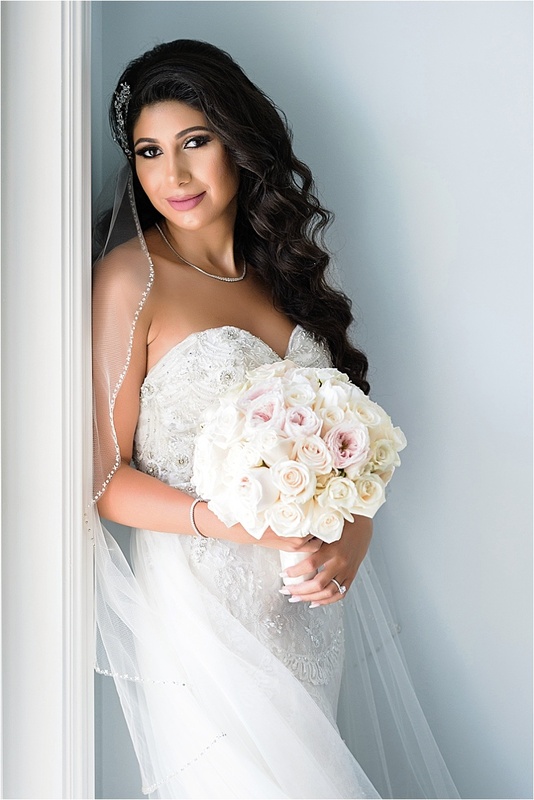 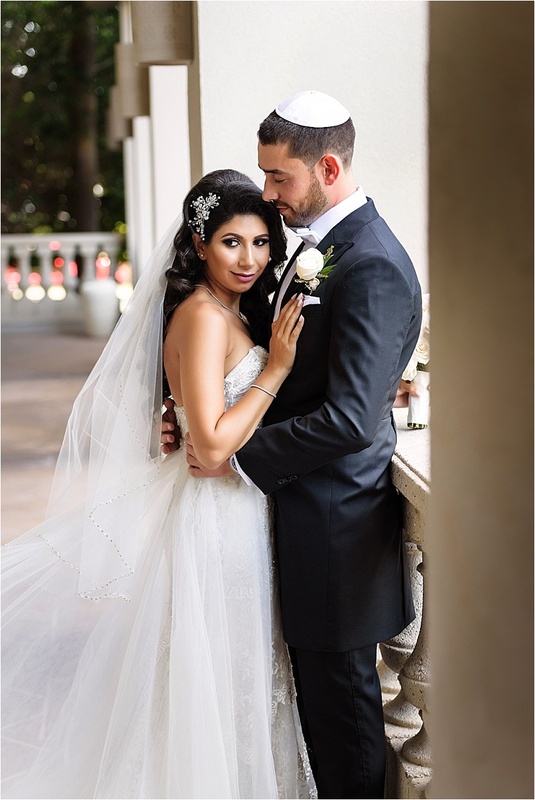 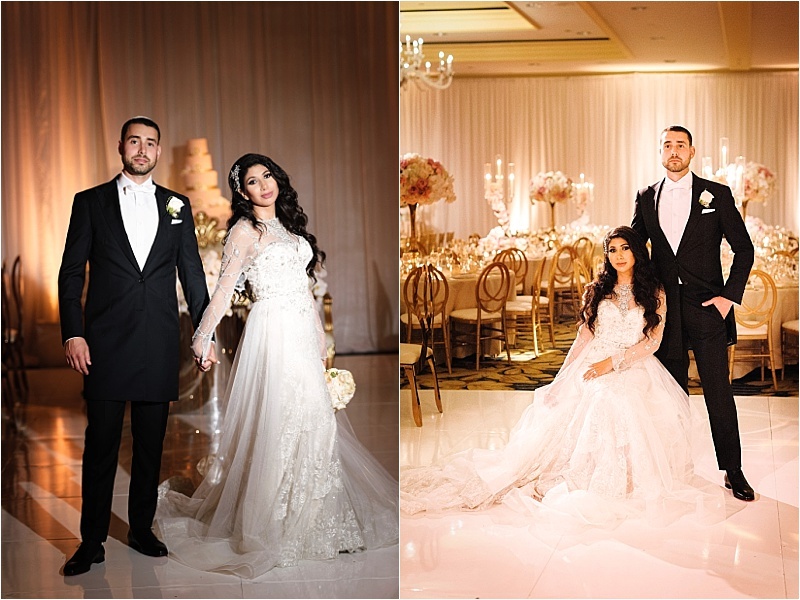 Mona wore a dazzling strapless gown from Panache Bridal that featured a sweetheart neckline, elegant lace and beading. 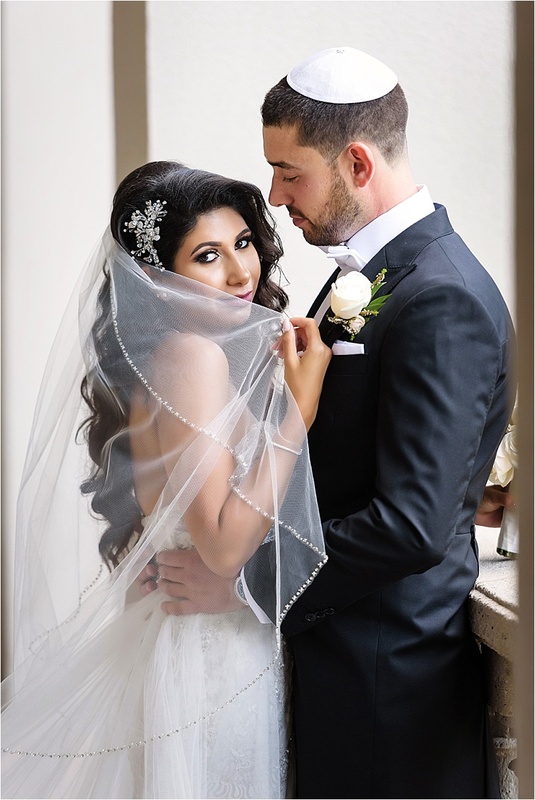 She paired it with glittering gold heels and a traditional full-length veil, plus a long-sleeved mesh overlay with classic draped beading for the ceremony.